Educational mission in the desert: Doka is forming University in Kuwait. Education is a society's greatest asset. Kuwait signalling intent for investment beyond oil reserves: With its new university campus, desert emirate population to gain access to top-quality education. Doka developed the formwork solution for the architecturally challenging structure. Demand for good educational opportunities is on the rise in Kuwait. The giant planned educational campus of Sabah Al Salam University City comprises in total more than 6 million m2 with numerous facilities separated by gender, where currently 1.7 million m2 are being executed. 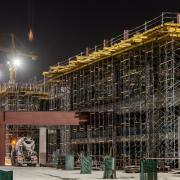 Doka Kuwait has secured with its formwork solutions around 70% of all formwork contracts with various contractors. 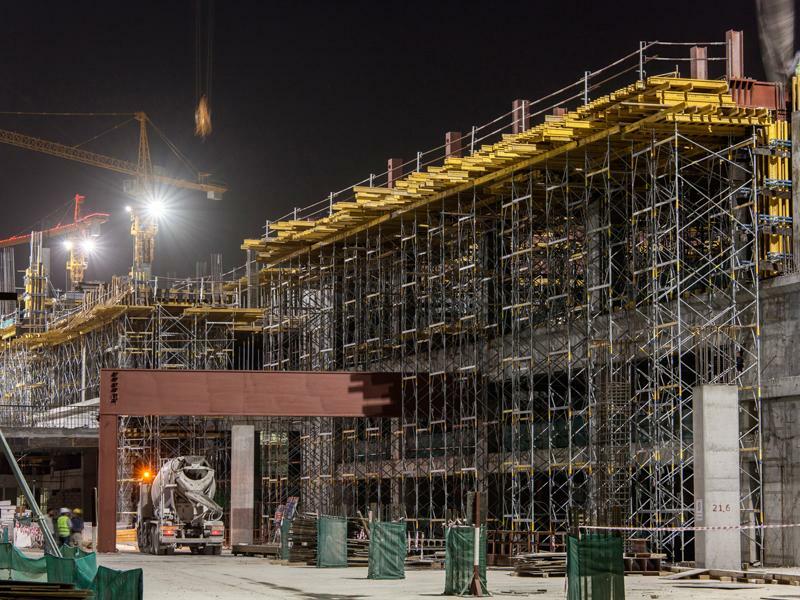 Sinohydro Corporation Ltd., the building contractor for a major campus, engaged Doka for supplying a pathbreaking full project formwork solution for the striking building design comprising five levels. Compared to the competition, Doka's reduced cycle time and just in time delivery help accelerate the construction progress. Challenges encountered during construction are the inclined columns as well as the high round columns and ceiling heights up to 8 m.
Core walls are erected using 20 sets of the Large-area formwork Top 50 and Climbing formwork 150F that are flexible in adapting to any shape or size. The support wall of 2,300 m total length and varying heights is erected using the Top 50 system. 55 sets of the Column formwork Top 50 are used to pour the columns, some of them inclined. Doka-Engineers recommended a combination of Load-bearing tower Staxo 40 and Dokaflex 1-2-4 for building the floor formwork. Due to the small number and light weight of its individual parts, Staxo 40 is assembled quickly and predestined for great ceiling heights. It is used to pour around 12,000 m² of floor slab. An additional 9,500 m² floor slab area is built using Dokaflex 1-2-4 as well. This formwork system is quickly set up and can be adjusted precisely to the heterogeneous building ground plans. Since large areas of the concrete sections will remain untreated, there is the added requirement for fair-faced concrete quality. It can be achieved by selecting any type of form-facing. From the very beginning: a seamless interaction. From the beginning, subcontractors and foremen are extremely knowledgeable about assembling Doka formwork systems. As a result, set-up and dismantling are finished in no time, thereby allowing for adherence to the schedule without any extra effort. The client's requirements changed several times during the planning stage. As a result, direct and regular communication with Doka Engineers was extremely valuable. The same holds true for a culture of rapid feedback and turn-around of appropriately customized adjustments. It made keeping on schedule with the tight cycling times possible. The proximity of the Doka branch in Kuwait is very helpful. Doka engineers and formwork instructors are always available for prompt support. 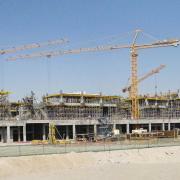 Doka trainings held before construction start ensured smooth set-up and operation of the formwork systems. Construction work will continue until 2015. Thank you for your interest - Educational mission in the desert: Doka is forming University in Kuwait.. Thank you very much for your interest - Educational mission in the desert: Doka is forming University in Kuwait..